On 25th and 26th June players in all age groups battled it out for a chance to win a title. On the Saturday over 40 children from as young as 5 played. The Jacks group (5 to 8 year olds) held their own mini tournament, which was great experience in keeping score, winning points and practising shots they’ve been learning over the last few months. Bertie emerged as winner with Tom coming a good second. All Jacks received medals for their great effort. The parent/child doubles fun event was popular with Emilia and Adrian Partridge winning the final – well done to all who entered in the Saturday’s events. On Sunday it was the turn of the adults, and many under 18s also competed. In the Mens Singles Mac Powell achieved silver and Zac Phillips got gold. In the Ladies Singles Sarah Preece claimed her title, beating Bronya Pike in the final. In the Mens Doubles Mac Powell and Zac Phillips teamed up to win gold, and in the Ladies Doubles sister pairing of Sarah and Hannah Preece overcame opponents Mandy Bishop and Bronya Pike to win the event. 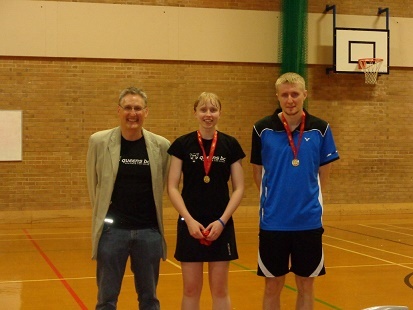 In the Mixed Doubles a now rather tired Zac Phillips paired with Sarah Preece (pictured below) managed to hold off Bronya Pike and Mac Powell culminating in Zac and Sarah winning all their events that day. A great achievement. The weekend tournament was a great event, refreshments and Club Shop ably run by Andy and Gail Wills, tournament scheduling successfully organised by Sue Williams and Sarah Preece. It also couldn’t have been done without all the coaches and volunteers, parents and players. Nick Masson, Club Chairman, said he was delighted with the positive attitudes and the great competitive play he witnessed over the whole weekend. Queens Badminton Club will be holding their 16th Annual Presentation Evening on Friday 15th July. All players and their families are invited to celebrate the last season.